AdzMedia Video, Native, Interstitial, Rich Media, Banner advertising network details. Adzmedia was established in 2012 with a mission of simplifying mobile advertising for both publishers and advertisers by using cutting-edge technology platforms which operate well on a data basis. 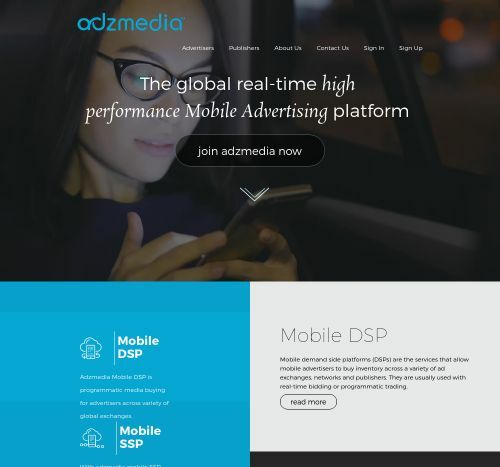 Joining Adzmedia, you will be offered powerful and self-serve advertising platforms with simple interfaces especially mobile DSP platform which allows advertisers to purchase inventory in exceptional mobile advertising networks and any key mobile RTB exchange. With Adzmedia DSP, your mobile ad campaigns can be easily created and monitored with detailed analytics. Adzmedia uses a patent-pending tool to provide clients with better management and conversion compared to other ad-formats. Plus, DSP is compatible with all kind of ad-formats from display, interstitial, rich media, to native and video. It's time to give your ads global visibility and a greater reach and connect with high-quality users with Adzmedia DSP! You can check Adzmedia reviews on Affbank and ask Adzmedia Team any question by using the contacts above, especially about how to earn money!